Everyone just assumes the bartender or your beer connoisseur friend just knows how to pour a beer. But, in all reality, we know that's not true. Start with a super clean glass. Should be obvious why. 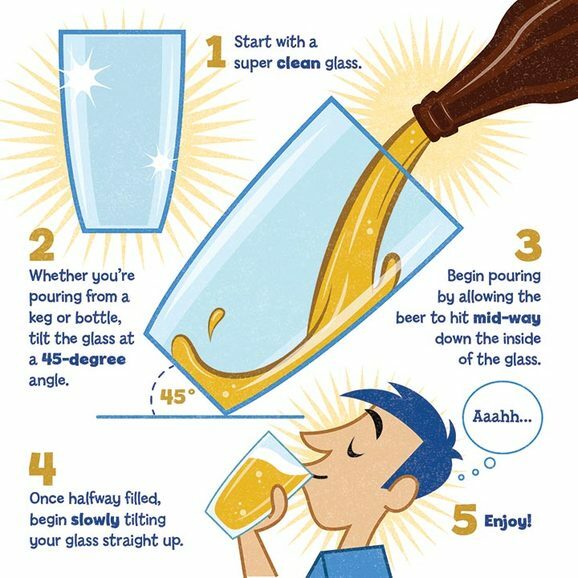 Whether you’re pouring from a keg or bottle, tilt the glass at a 45-degree angle. Begin pouring by allowing the beer to hit mid-way down the inside of the glass.Doing so will prevent your beer from having too much head. And, too much head means you can't enjoy that beer as soon as you'd like. Once halfway filled, begin slowly tilting your glass up straight. This will add the perfect amount of foam to the top of the glass. Not too much, not too little, but just right. Enjoy. Need we say more? But, the tips don't stop there. How else can you impress your friends by being the know-it-all of serving beer? Keep a few glasses in the freezer for those friends who enjoy their beer extra frosty. Notice that your beer keeps bubbling long after you've poured your glass? Could be two things: 1. Your glass wasn't as clean as you thought. 2. You have an extra special glass with etching on the bottom. In other words, your beer is supposed to keep bubbling. If you have an at-home kegerator, keep your lines and taps clean in between keg changes. Especially if you change beer types each time. Keg beer typically lasts 45-60 days. Bottled and can beer typically lasts 90-120 days. Now that you're beer-ducated, get to gettin' on spreading the beer knowledge and looking like a pro-bartender. Thanks for the tips Food Should Taste Good!